If you use the fonts and letter designs built-in to the Brother SE400, you have to stitch each letter separately because you can’t change the size of the individual letters in a “word.” You can set the size of the pre-programmed letters to small, medium or large on the Layout screen. And then you can resize to a certain extent with the size buttons. But you can’t size the letters individually. So if you want a monogram with a large center letter, you have to stitch the letters one at a time, setting the size for each. If the complete monogram is less than 3.9″×3.9″, it’s easy to adjust the placement because you just move the layout using the positioning keys in the Layout – Adjust screen.You don’t have to re-hoop and the machine stitches a little stitch to help you line up the letters. See the Operation Manual on page 146 for instructions. If you don’t like the built-in letters or want them smaller or larger, or want a fancy monogram, for example on a towel with letters in a diamond or circle, you’ll need a monogram alphabet design set. It will include three sets of letters: the large center, left and right that you can put together into three letter monograms. Some of them also have designs for borders or flourishes. Each letter comes in a separate design (PES) file and the SE400 can only stitch one file at a time. See my tutorial on transferring design files from your computer to the SE400. There are two options. You can stitch each letter separately and learn how to line them up. This isn’t so difficult if all three letters fit inside the 3.9″×3.9″ embroidery area. If you want a really big monogram that won’t fit, your only option is to split the design, rehoop and stitch each section separately. But it’s not easy to get the sections lined up and spaced correctly. The quickest and easiest way is to combine the letters using embroidery editing software, save the design as a PES file, transfer it to the SE400 and stitch it all at once. This will give you a nice design and you won’t have to fuss with spacing and lining up the letters. This only works if the whole monogram is less than 3.9″x3.9″. I can’t recommend particular software because there are so many choices that I can’t keep up with and because so much depends on individual needs and preferences. Many people like Embird. Some people say Embird is very powerful, but has a steep learning curve. Others prefer different software as less expensive and easier to use. You need the Basic Embird for combining letters from alphabet designs. There are also add-on modules for lettering. One lets you take ordinary fonts from your computer and convert them to embroidery designs. You can also change the shape for a circular or diamond monogram, etc. 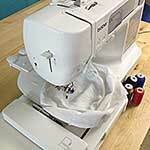 People also like SewWhat Pro. Both Embird and SewWhatPro have free thirty-day trials so you can try it before you buy. You can use special monograming software. I don’t know anything about them because I prefer general purpose software that I can use for other things. I use Embrilliance because it runs on my Mac as well as on a PC. Embrilliance Essentials has 12 built in Alphabets that you can use to make text, names or monograms and you can resize the lettering and the program adjusts the stitch count as you resize. It also offers some different style options for making monograms from the built-in fonts. It’s also very easy to learn and use. Emblibrary has some of my favorite and most helpful tutorials online. Here are two on monograming and while you’re there, check out the others on stabilizers, etc. Basically monograms are either 1, 2 or 3 letters which are combined or merged together. Many designers offer monogram letter design sets online. Since the maximum embroidery area of the SE400 is 3.9″x3.9″, I would suggest you look for alphabets that have several sizes such as 0.5 to 3 inch. Depending on the width of the letters, for a three letter monogram, you maybe able to use a 1 and a half inch or 2 inch letter as the middle letter and .75 inch letters or 1 inch for the left and right letters so that all the letters fit in your 4×4 hoop. Having several sizes of letters for one alphabet gives you lots of options to play with when making monograms. Circular monograms: http://www.8clawsandapaw.com/infinity-monogram-alphabet-embroidery-design.html and http://www.embroiderydesigns.com/fonts/Monograms.aspx. Large letters: http://www.8clawsandapaw.com/infinity-monogram-alphabet-embroidery-design.html. This set comes in sizes from 1″ to 6″. The largest ones are too large but there is a 3″ one. The 4″ one may or may not work since the actual maximum size for the SE400 is 3.9″. You could scale it a little with embroidery software. If you don’t have software, try the free Wilcom TrueSizer. Purchasing digitzed Alphabets allows you to choose the style of letters and size of letters you would use the most. I would like a referral on where I can get my Se400 here 8n the UK. 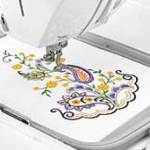 I have never used a sewing machine but Would love to work on the embroidery machine as I love the creativity. I can’t get my Se400 to sew buttonholes. It’s starts out and goes backward and then stops and sews in place. I have tried to figure out why it want work but to no avail. My zig zag and other stitches work fine. How do you put a space between a persons first and last name on a Brother SE 400 E. machine? Sal explains how to find all of the possible three letter words when we can use each letter as many times as we want, and when each letter can only be used once. I want to make initials on man’s cuff on shirt with the center initial beings larger. I have Brothers SE350 machine. How do you “space” between letters ex: of a ? I’d like to embroider on fabric bracelets. I just purchased a small hoop (as per your suggestion) to make this easier. I also need fonts small enough to fit on a 1/2 inch bracelet. Do the fonts on the SE400 size down that much? Where else can I find small fonts? Any other suggestions? I am new to this.